Karan Johar received backlash from social media users fans after he liked an anti- Shah Rukh Khan tweet which trolled superstar. Reportedly, Karan liked an anti-SRK tweet posted by a social media user that spoke about Akshay Kumar's latest release "Kesari" and compared Shah Rukh to Akshay's stardom and apparently called him as "B grade" actor. The tweet read: "Half day collections of 'Kesari' on Holiday (which is worse than pre-Diwali day) is greater than 'Zero' full festival day collection." 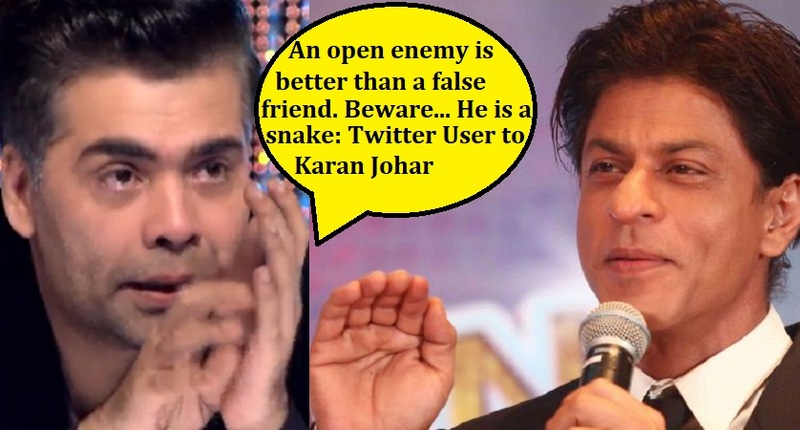 Karan's like on the comment did not go well with SRK fans as they started a #shameonKaran trend on Twitter and started questioning his friendship with SRK. Now, reacting to the whole controversy, Shah Rukh Khan took to his Twitter account and revealed that mistakes are bound to happen and that KJo is technically challenged and has fat fingers, so instead of making war, make love. Here's what he tweeted: "I hate clarifications on SM. @karanjohar is technologically challenged but has other good qualities like his taste in clothes! ?Just like Life, twitter doesn't come with instructions, so mistakes r natural...& also he has fat fingers. Go easy all, Make Lov not War...it's more fun"
After receiving backlash, Karan apologized saying that there is a technical issue and he will personally never acknowledge such comments. He wrote: "Guys I am having a technical problem with my Twitter account! Strange things are going on... From uploading shoe picture and gibberish to liking tweets I haven't even read and would never even acknowledge. "Please bear with me and I apologize for any inconvenience. Sorting it out asap." But it seems damage has already been done as one user called Karan "snake". "An open enemy is better than a false friend. Beware... He is a snake." Another user urged everyone to "boycott" Karan's movies. There is one user who said that Karan "can't be a good friend of anyone because he cares about money". Karan has co-produced "Kesari", which released on Thursday, March 21, 2019. Alia And Varun Banish All The Superstition Around Black With.... Kriti Sanon shares the GLIMPSES of her power-packed performance!